Depending on where you live and how you wash your clothes, the linen cupboard can become a little musty and your bedsheets, towels, etc. can stop smelling fresh. A reader asked me how to fix this recently and thought you may like this quick tip. Linen Cupboard Deodoriser will help to eliminate the musty smell. 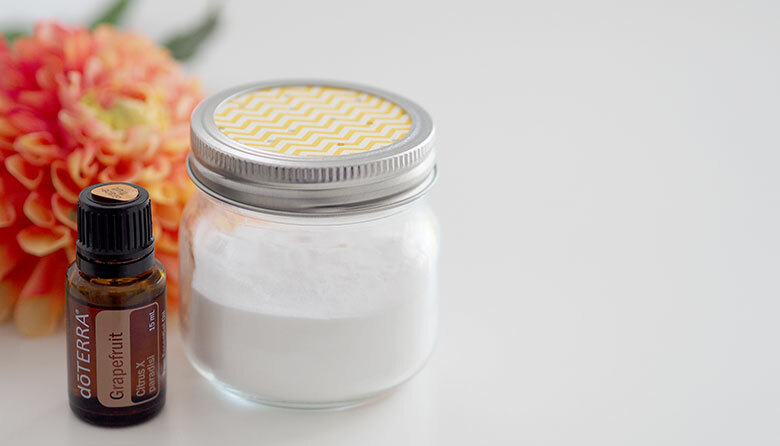 Simply fill a little mason jar with baking soda and add a few drops of your favourite essential oil. The baking powder is known for it’s deodorising and neutralising properties. 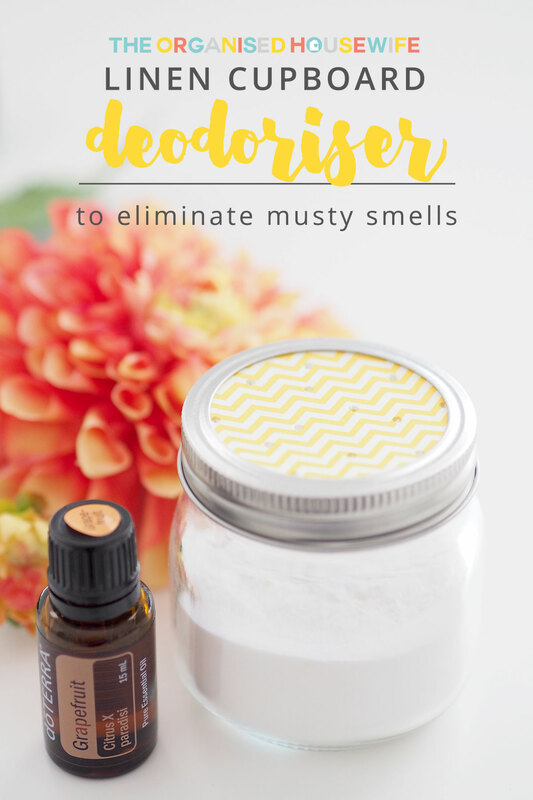 This can also be used as a room deodoriser to freshen up any room…. bathroom, bedroom, wardrobes, etc. 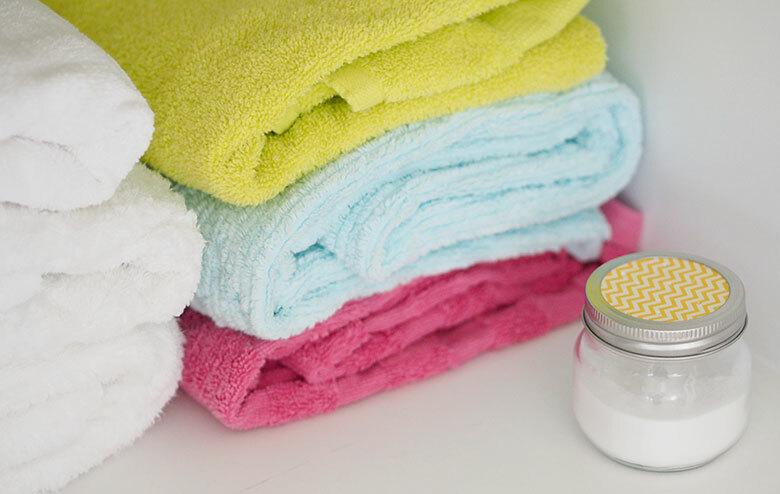 BAKING SODA – helps neutralise odours around the home and in the fridge. Baking soda and bicarbonate of soda are different names for the same thing. ESSENTIAL OIL – in this case, essential oils help to refresh the air to give a pleasant smell. However, there are many more benefits than just making your home smell nice (read more here). Join my Facebook group The Organised Housewife – Essential Oils. STORAGE – Use a mason jar with a canning lid and replace the metal insert with cardboard. Cut the cardboard (or thick paper) to size and add a few holes. I’m using a jar that I found at a local dollar store. However, you can find a great variety here and use the daisy cut lid instead of the cardboard with holes. When you notice the scent starting to fade, give the jar a little shake to reactivate the oils and baking soda again. Replace after 3 months. Do you have troubles with your linen cupboard? I put a damp absorber in ours an am amazed at how much it has collected in just a few months. Has all but eliminated the musty smell too! Hi kat i would like to know which one last longer the baking soda one or the gel type air freshners? How many drops of oil should you use?